Who Spoke Up research papers discuss the civil rights movement and two apologists points of view on this event in history. The antiwar movement that arose in response to the Vietnam War was a complex phenomena. 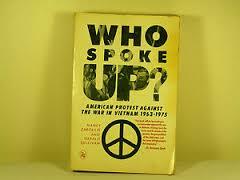 Have Paper Masters custom write a research paper on the Anti-war Movement as it is outlined in Zaroulis and Sullivan's book Who Spoke Up. Finally, the antiwar movement was not “anti-American”. These are, in my opinion, valid points. In making them the two writers are seeking to overcome some of the perceptions of the movement that were bandied about by its enemies in government and the press. But there is another set of opinions about the movement, and the people who were a part of it, which has been bandied about by its friends in the movement itself and in the press. And this set of opinions contains elements that are also things that, it can be argued, the movement was not. There was always a reason why someone became involved in the movement. Because it became a huge movement some of those reasons were less than admirable. There were those, like Tom Hayden, who cherished political ambitions. There were left-overs from the Civil Rights movement who had enjoyed the spot light and had to move on to a new movement now that the antiwar movement had stolen the spotlight. There was the phenomena of radical chic which made attending a protest the “in thing” to do. And there were those who found themselves in more of a mood to protest when the war threatened to sweep them up in it. Neil Sheehan, a far less biased and far more sophisticated writer than Zaroulis and Sullivan, points out that by 1967 the demands of the army for men caused the drafting of people after their deferments had expired, and that 1967 was the year that the campuses boiled over in turmoil. He points out, “The threat of being conscripted for a war…made marchers out of young men who might otherwise have been less concerned over the victimization of the Asian people”. Vietnam War - Vietnam War term paper looks at the war and how it progressed after the Geneva Accords. Coming of Age in Mississippi - Who Spoke Up - Who Spoke Up research papers discuss the civil rights movement and two apologists points of view on this event in history. Civil Rights Act of 1964 - Who Spoke Up - Who Spoke Up research papers discuss the civil rights movement and two apologists points of view on this event in history. Anti-War Sentiment in All Quiet on the Western Front - Anti-Vietnam War Sentiment research papers follow the negative reaction of US citizens concerning the Vietnam War. Women and the Vietnam War - Women and the Vietnam War research papers discuss the many ways women worked to help support the war and their country. Paris Peace Accord - Paris Peace Accord dramatically impacted the Vietnamese people, and it also gave credence to those who argued that the United States “lost” the Vietnam conflict. Order a research paper on Paris Peace Accord from Paper Masters. Entering Vietnam - Entering Vietnam research papers examine the situation in French Indochina prior to the Vietnam War. Slacks and Calluses - Slacks and Calluses research papers discuss the expectations placed on women by society during WWII. Kennedy and Vietnam - Kennedy and Vietnam Research Papers look at the shortcomings that the United States had in its approach toward the Vietnam conflict. Civil Disobedience - The SDS and other groups were vital to organizing protest marches and other forms of civil disobedience. Paper Masters writes custom research papers on Who Spoke Up and discuss the civil rights movement and two apologists points of view on this event in history.